CAMPUSHABITAT5U is a strategic group specializing in Habitat and Territory with the goal of fostering and stimulating a process of smart, sustainable and inclusive growth based on creativity, knowledge and interdisciplinary innovation in excellence. It aims to become a benchmark in science, technology and creativity in the region of the European Mediterranean Arc in the sphere of Habitat and Territory. In the last decade, R&D figures in the Valencian Community (CV) have doubled, with growth exceeding the national average. The same has occurred with R&D investment by Valencian universities, which account for 46% of total R&D investment in the CV. Data from the Valencia Science and Technology System (SVCYT) on R&D staff and researchers collected in the EJC also point to strong growth. In five years, the number of R&D personnel has grown by 58%, reaching 15,256 individuals, while the number of R&D researchers has reached a total of 12,076. Scientific output has also increased considerably, both in terms of the number of articles published in journals indexed in international databases (from 3,087 in 2001 to over 5,000 in 2007), and in their quality. The quality of these articles is demonstrated by a pronounced increase in the number of times they are cited, the average number of citations in scientific articles, and the average number of citations per 100 researchers, as well as in the reduction in the percentage of articles which are not cited. They are core constituents of the Valencia Science and Technology System, managing 49% of the financial and human resources dedicated to R&D in the CV. They generate 19.2% of all patents in Spain and 36.4% of all European patents developed at Spanish universities. Of patents from Valencian universities, 68.7% are being exploited and generating financial gain. This same figure is only 34.1% in Spain. They produce 12.4% of the articles published in Spanish scientific journals and 98% of those published by public and private universities in the CV. They have generated 1.748 million euros in technology capital from investment in R&D, which represents 42% of cumulative technology capital in the CV. The number and type of technology institutes in the CV also demonstrates that the CV is a region which places great emphasis on the promotion of scientific research and technological development. These centres – which are part of the Network of Technology Institutes of the Valencian Community (REDIT), and all of which belong to CAMPUSHABITAT5U – despite their relative youth, are already well-established and have permanent staffs of reliable research personnel. Their distribution throughout the territory also makes them key drivers for social cohesion and productivity in their respective areas. At the same time, the science parks of the five Valencian public universities, which are at different stages of development, are becoming new focal points for the integration of scientific, technological and industrial interests within today’s knowledge society. As already mentioned, the increased research activity of the five universities in the alliance in recent years as well as their socio-economic contributions are related to the growth and modernization of support structures for research and knowledge transfer. Four inter-university research institutes and two joint CSIC-UV institutes including the Institute for Corpuscular Physics, the Institute of Material Sciences and the Institute of Robotics and Information and Communication Technologies. More than 60 technology companies active in the fields of habitat, energy, information and communication technologies, and more. A business incubator for projects promoted by external companies as well as for university and research group spin-offs. More than 1,300 researchers and support personnel who work at the PCUV every day. Twenty-seven research and technology centres including the Institute of Chemical Technology, the Institute for Energy Technology, the Biomechanics Institute of Valencia and the Institute for Computer Technology (see details in 2.5, Alliances). More than 20 technology-based companies and business associations. More than 2,500 researchers and support personnel who work at the CPI every day. The Institute of Ceramic Technology (ITC). The University Institute of Pesticides and Water (IUPA). The UJI Central Scientific Instrument Services. More than 300 researchers and support personnel who work every day at Espaitec. A science unit with knowledge management centres, research institutes and joint R&D laboratories. A technology unit with business creation centres and science-based businesses, specialized sectoral clusters. Lifelong learning centre for professionals. Scientific instrument services, scientific and technological consulting services, and more. Science and Business Park of the UMH. This park has more than 60,000 m2 of developable land spread across four cities: Elche (30,000 m2), Altea (10,000 m2), Orihuela (20,000 m2) and San Juan (3,000 m2). It currently has five fully operational buildings and more than 15,000 m2 of constructed land. The Office for the Transfer of Research Results (UV). The Support Centre for Innovation, Research and Technology Transfer (UPV). SGITT-OTRI: The Research and Technology Transfer Management Service and the Research Results Transfer Office (UA). The Office for Cooperation in Research and Technological Development (UJI). The Office for the Transfer of Research Results (UMH). The research budget for the five universities exceeds 400 million euros while income from contracted R&D projects, technology transfer and support is over 50 million euros. support of innovation and the transfer of knowledge and technology. UV: The UV has several support programmes for the creation of businesses. University Extension (antenna): A project launched in 2006 via an agreement with the UV and the Official Chamber of Commerce, Industry and Navigation of Valencia in order to cooperate with other institutions in the promotion of entrepreneurial initiatives in the university community and in the provision of services of value to the business community. Created in 1992, this was the first programme for the support of university entrepreneurship in Spain. Since its inception it has provided support for the creation and development of more than 500 businesses and consulting services for more than 5,000 entrepreneurs. At the same time, it has taken part in several projects and collaborative efforts both within Spain and internationally, making the institute a leader to be followed in university business creation. The institute has been recognized by prestigious awards, including the European Enterprise Awards 2008-2009. This unit offers comprehensive services to all entrepreneurially minded students who would like to develop a business project. The centre provides consulting services, business plan creation services, a business creation centre, seminars and training courses. This is a programme for the development of technology-based companies. It promotes collaboration between students in the Faculty of Legal and Economic Sciences and researchers in the UJI University School of Science and Technology. This programme was launched by the university to provide support for the detection and development of business opportunities in the university environment. The objective of this programme is to promote and support the launch of technology- and knowledge-based companies with the utmost guarantees of viability. Technological entrepreneurs who would like to analyze their ideas and launch a business have a variety of services at their disposal. In the creation of the European Higher Education Area (EHEA), doctoral programmes play a key role in the convergence of the EHEA with the European Research Area (ERA). Research must be clearly prioritized as a key component of university education, and mobility must be valued both at the doctoral and post-doctoral level as an essential tool in the education of young researchers. The process of moving our current productive model towards a more sustainable economy means that doctoral students and graduates must take on leading roles in society for the generation, transfer and adaptation of R&D&i. They must be actively involved in all institutions devoted to innovation and research so that they can take their place at the forefront of the transformation of knowledge into something that improves people’s lives. The universities’ institutional R&D&i strategies must make the doctoral degree the centrepiece of their actions. They must allow for wide-ranging flexibility and autonomy while achieving high levels of quality, internationalization, innovation, recognition and mobility. The number of personnel with research and innovation skills must also be substantially increased. At the same time, their influence and employment must be promoted both within and beyond academia. Organizing courses, conferences and seminars for instruction in general competences for candidates in different doctoral programmesIn accordance with the new royal decree, doctoral students will acquire certain multi-disciplinary skills which will enable them to pursue professional careers or to work in the generation and transfer of knowledge, in accordance with the leadership role of doctors in society. CAMPUSHABITAT5U aspires to make a qualitative leap forward in scientific advancement and the transfer of knowledge through the development of a coordinated institutional research and innovation policy through the Habitat and Territory R&D&i Institute. Construction: recovery of principles of Mediterranean architecture, one of the objectives of this being to improve energy efficiency. Construction and housing: analysis of regional climate-related building techniques of other areas in order to incorporate new methods and materials. Planning and management: conservation and promotion of diversity and multi-functionality of rural areas, in particular agricultural areas with great historical or cultural significance which are part of the area’s identity and heritage, such as orchards and meadows. Social setting: promotion of theoretical and applied research on science tourism, and study of the feasibility of implementing programmes with universities and research centres in the Valencian Community via the science Chair for the Dissemination of Science, the botanical gardens, the astronomical observatory, and others. Social setting: promotion of a territorial social research platform revolving around projects, resources and capabilities of CAMPUSHABITAT5U’s research institutes (including Polibienestar, Biomecánica-IBV and Desarrollo Local-Iidl). A concept of Habitat and Territory which contemplates sustainability and inclusivity needs not only to address its intrinsic social aspect, above all it must incorporate a new vision which places the highest priority on the system of rules and policies that determine how the territory is used and organized, building requirements and regulations, and most importantly, lifestyles and values. The platform will develop projects from the perspective of the economy of lifestyle, social and inclusive well-being and local sustainable development. Creation of a programme to develop an open platform for the promotion of exchanges of university research staff with technology centres and businesses through participation in applied research projects as well as participation of business professionals and technology experts from private concerns and technological centres in university educational projectsThe programme will design incentives to promote bi-directional mobility for short-term exchanges which will help to build an open network with the five universities and the seven technology institutes participating in the project, as well as businesses in the sector which voluntarily elect to join the programme. Please refer to the list of proposals for internationalization in Area 2.6, Internationalization Policies. CAMPUSHABITAT5Uwill increase the capacity of support and assessment units in the five universities to transfer knowledge through the establishment of an assessment programme in the area of Habitat and Territory.In order to achieve this aim, the creation of an Interuniversity R&D Protection, Assessment and Marketing Unit in Habitat and Territory is planned. Creation of a Habitat and Territory showroom at the Habitat and Territory event at the Valencia Trade Fair Centre and the Trade Fair Institute of Alicante.The fair and conference institutions of the Valencian Community are leaders in the organization of events in the many sectors linked to habitat, such as tiling, furnishing, household accessories, and so on.The goal here is to increase visibility of the CAMPUSHABITAT5U project through active participation of the members of the CIE and the creation of a permanent showroom at all fair events in the sphere of Habitat and Territory organized by the Valencia Trade Fair Centre and the Trade Fair Institute of Alicante in order to increase visibility of the educational and research activities of the project amongst members of the business and academic communities. Furthermore, the campus plans to join the organizing committee for fair events related to the area of Habitat a Territory in order to improve its capacity in and increase the visibility of innovations that have been developed. 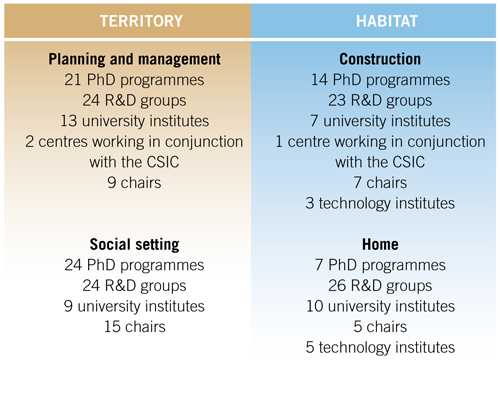 Organization of international events in Habitat and Territory that are open to the public, which serve to bring together scientists and intellectuals under one roof to discuss and plan new forms of sustainable, inclusive growth.This includes the organization of an international forum in Habitat and Territory. The forum reinforces CAMPUSHABITAT5U’s commitment to all of its stakeholders and to the public to apply results and advancements to the process of change and to involve scientific research in the area of Habitat and Territory. The forum is slated to be held at the same time as World Habitat Day and the Valencia International Habitat Fair and will include the representatives of United Nations-HABITAT for the purpose of publicizing our shared mission: promoting the social and environmentally sustainable development of human settlements and achieving adequate housing for everyone. Landscape and Territory ObservatoryCAMPUSHABITAT5U will work with the government of Valencia to create a common strategy to coordinate a wide variety of programmes and actions to be implemented in the CV – both in public universities and research centres, with the cooperation of governmental bodies – in order to address issues related to the protection of the territory’s landscape and to promote local development through the creation of the Landscape and Territory Observatory. This project was borne from a collaborative agreement with the government of Valencia which is to be developed under the aegis of the CAMPUSHABITAT5U programme. It is an inter-university programme with the objective of monitoring and assessing the natural resources and heritage of the CV in keeping with the model provided by analogous European observatories. CAMPUSHABITAT5Uwill support the activities of the observatory via a platform for innovation in sustainable development in the territory.CAMPUSHABITAT5U plans to create this platform through the recruitment of political institutions interested in environmental management, leading international research centres involved in the diagnosis of the state of the environment, businesses capable of providing consulting service and direct action, as well as highly capable university research groups that have the capacity to do research and provide instruction in advanced knowledge closely related to the areas of action ofCAMPUSHABITAT5U. Creation of a platform for innovation in sustainable development in the territory. This will play a key role in inter-institutional coordination between the government of Valencia and the institutions promoting CAMPUSHABITAT5U which will help to increase the generation of R&D&i of excellence in the area of Landscape and Territory in key advocate research groups and institutions. The creation the observatory and the activity of the observatory will act as an instrument to contribute towards the protection, administration and regulation of the CV’s rural areas. The observatory will apply a comprehensive approach within the framework of sustainable development and will drive action through the creation of proposals and promotion of measures in the area of landscape and territory. CreaInCube is a CAMPUSHABITAT5U proposal for the creation of a new multi-disciplinary forum for the contemplation and incubation of new options, focuses and strategies for growth via creative We coffees, workshops and creative coaching workshops employing the new driving force for prosperity, CREATIVITY. As a hub for innovation, CAMPUSHABITAT5U purports to create a “Patchwork for Creativity” in the Valencian Community to act as a catalyst for new creative industries. The patchwork will provide a meeting space for culture, technology, science and society, providing new models of technology and knowledge transfer for business that are economically feasible and sustainable over the long-term. CAMPUSHABITAT5U, through CreaInCube, will launch an initiative to encourage Valencian university students’ creativity and innovation, enabling the creation of business projects which hold the internal values of a generation that is ready for change and new ideas in the knowledge society. A creative culture inspires development that is centred on people and is a key ingredient in the creation of employment, innovation and commerce while contributing to social inclusion, cultural diversity and environmental sustainability. For all of these reasons, it offers an excellent tool to combat future economic crises and to contribute to growth and prosperity, especially for countries which are trying to diversify their economies. This is why all parties which wish to generate wealth, employment and quality of life (e.g. science parks) or which are searching for new, innovative, sustainable strategies that promote “regional growth while maintaining social well-being” must strive to support measures that promote creativity in their areas. Habitat and Territory are subjects which should be approached from an interdisciplinary point of view with the aid of urban planners, architects, engineers, sociologists, economists, etc. The centre will promote the exchange of ideas between teaching and research staff and young pre-doctorate researchers from a wide range of disciplines for the subsequent development of collaborative research projects. The centre’s objective is to admit approximately 15 people every year to pursue these types of research projects. The goal is to improve dialogue between the different academic cultures in the sciences, engineering, architecture and humanities and to design and develop collaborative research projects. The five universities in the alliances may offer grants through the centre for the purpose of allowing teaching and research staff and young researchers to pursue the proposed interdisciplinary projects and participate in scientific activities at the centre.With this measure, the centre hopes to establish a network of intellectuals to promote dialogue between the different academic disciplines of the SUPV. CAMPUSHABITAT5U believes this will lead directly or indirectly to new interdisciplinary projects.In order to make this possible, teaching and research staff will be excused from some of their duties. The centre will provide funding for visiting professors for the period of their participation in the project (approximately 30,000 euros per professor). 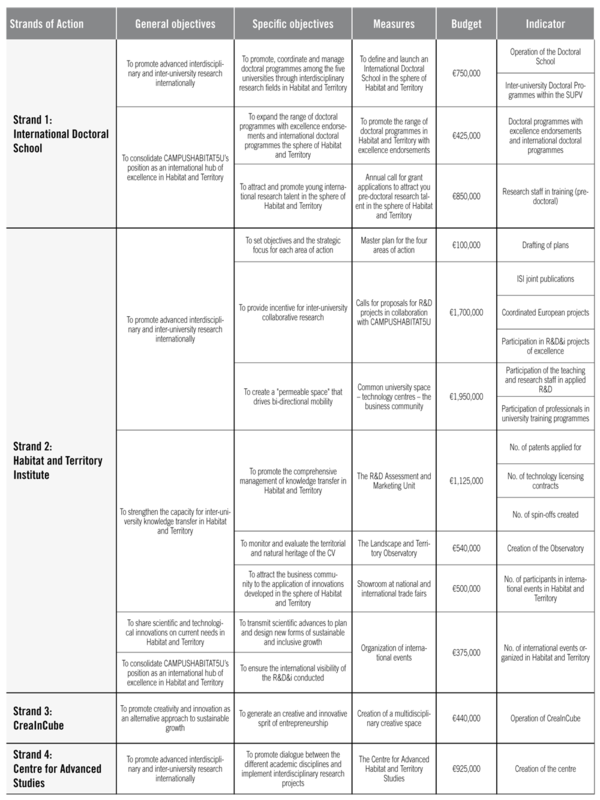 Funds for new programmes may also be made available if they help to relieve teaching and research staff of their regular duties.People receiving grants may request additional financial assistance for new interdisciplinary projects in areas which require collaboration among the different academic disciplines. Decisions on the awarding of grants will be made by a selection committee comprised of representatives from the five universities. Providing grants for projects is a key element of centre’s programme and an important compliment to financial assistance for teaching and research staff and young pre-doctorate researchers. Projects will be created based on dialogue and cooperation among the member of the centre. This will allow academic collaborative efforts to be transformed into long-term research groups. The centre’s projects are a key component of its strategy for the creation of a research network that connects the sciences, engineering, architecture and humanities. Another important facet of the centre will be the organization of events to promote communication among the different academic disciplines and to illustrate the importance of building bridges between the sciences, engineering, architecture and the humanities. This programme will not only be open to senior research teaching staff and junior researchers, it will also be open to students and the public. The centre will offer several activities, including conferences, summer and winter schools as well as workshops and symposia.